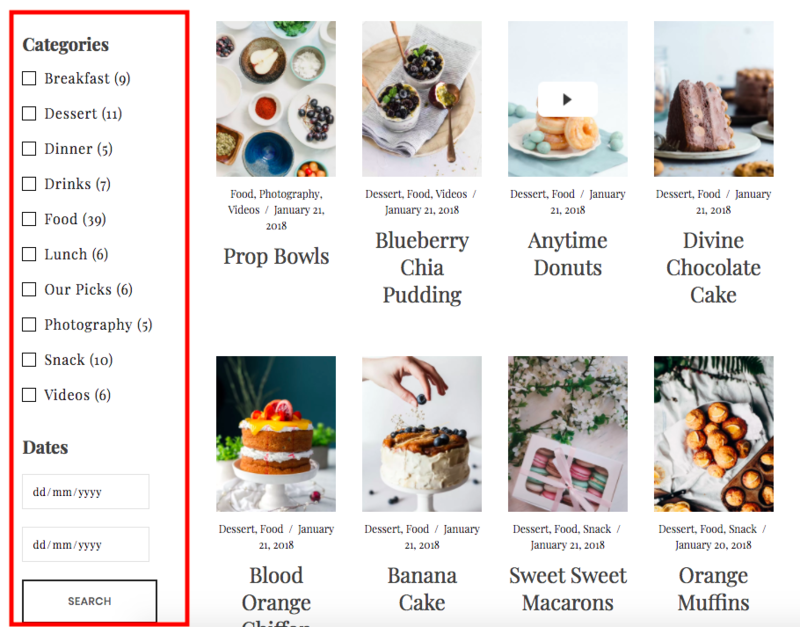 The Recipe Index template may not work as expected withthe new WordPress 5+ version if you're using the new "blocks" editor. In order to keep using the recipe template feature, use the Classic Editor. Learn more here. The Recipe Index page template is a powerful template to display and organize your posts. To create a recipe index, create a new page from the Dashboard. choose "Recipe Index" as the page template (from the Page Attributes area on the right hand side) and click "Publish". After the edit page loads again, you will see new settings in light purple boxes on the right sidebar. There are two ways this page template can be set up. If the plugin is not installed or is inactive, Elara Pro comes with a built-in Recipe Index format that allows you to check mark the categories you would like to show on this Recipe Index template. 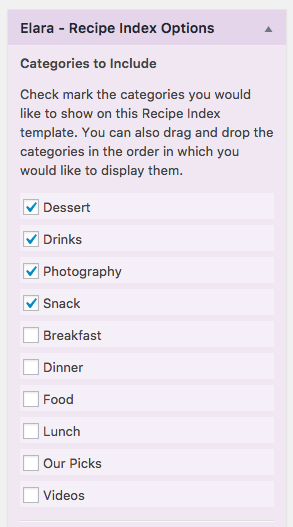 You can also drag and drop the categories in the order in which you would like to display them. Here is a demo of the Recipe Index template without the plugin activated (without filters). If the Search and Filter plugin is active, select from categories, tags, and dates to be displayed as "filters" in the left hand sidebar. Click here for a demo of the Recipe Index with the plugin activated (with filters).